70-80% of all integration projects fail to deliver the anticipated value. Evidence suggests that the first 100 days are critical to long-term value creation. 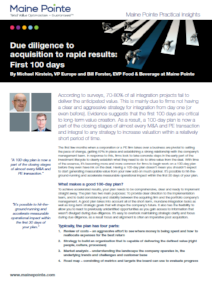 As a result, a 100-day plan is now a part of the closing stages of almost every M&A and PE transaction and integral to any strategy to increase valuation within a relatively short period of time. What makes a good 100-day plan? What can you realistically expect to achieve in the first 100 days?